The purpose of this project is to develop a simple proof-of-concept public dashboard platform that can display various environmental and utility data. In order to demonstrate full potentials of the dashboard, we plan to develop a working solar station which can measure the solar energy, temperature, and air humidity in real-time, as shown in Fig. 1. 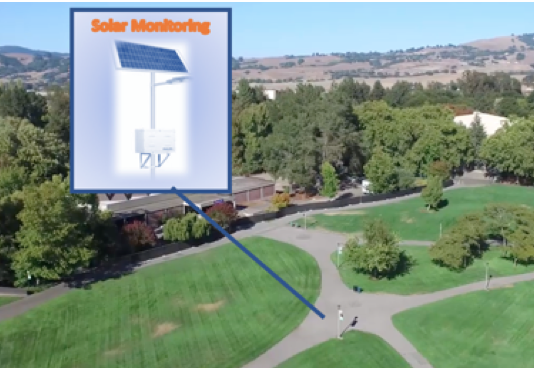 The data received from the solar station will be displayed on the dashboard for students and public to view and analyze. We believe though developing this prototype, we will be able to learn about various challenges and benefits of a scalable dashboard, including technical IT issues, general community interest, and possible educational advantages. Our long-term vision in developing this prototype is to be able to consolidate and arrange available campus-wide statistics, metrics related to campus electricity, water, recycled water and solid waste, and data reported by various sources, including utility meters, on a single Campus-Wide Utility Monitoring Dashboard (CDash), as shown in Fig. 2. The web page will be readily available to the campus and the local community, as well as the Chancellor’s office. Though such system we can provide critical insights about campus sustainability practices and their effectiveness. Furthermore, CDash can act as a great educational tool for students to learn about their own ecological footprint. For example, CDash offers the opportunity for students to collaborate with the campus community on real-life projects.